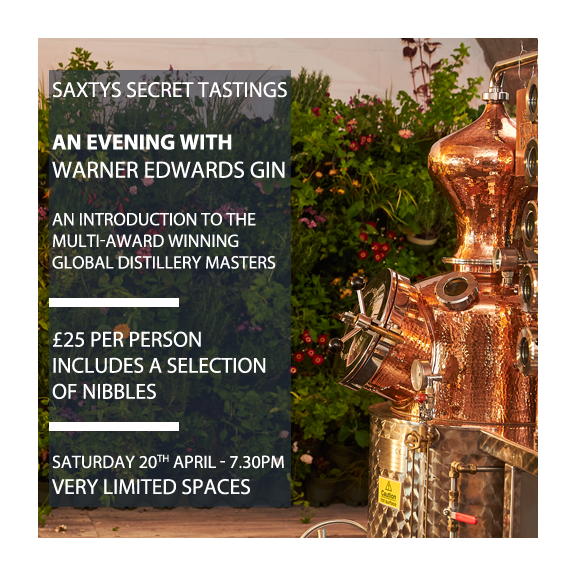 Join us in Saxtys Bar for an evening with the award-winning Gin distillers, Warner Edwards. You will sample the fantastic range: Harrington Dry Gin Melissa Gin Elderflower Gin Honeybee Gin Rhubarb Gin Sloe Gin Enjoy 6 taster samples with the perfect mixers and garnishes alongside a selection of delicious nibbles! *PLEASE NOTE: There are no physical tickets issued for this tasting. We keep a record in-house so that you don't need to bring anything with you. Further T&Cs can be found on our website.